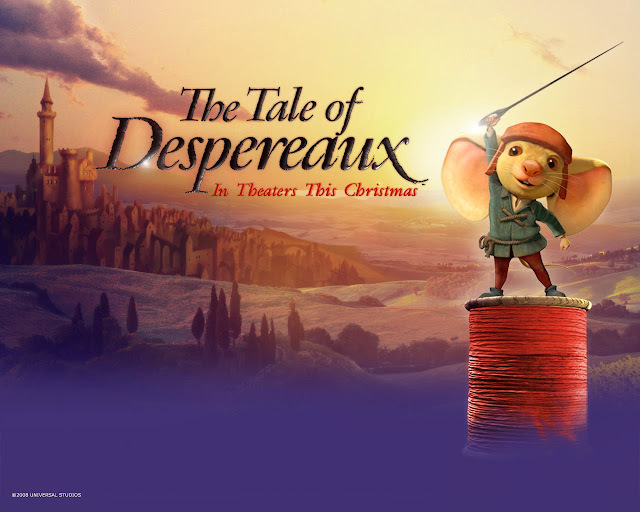 The Tale of Despereaux is a 2008 British-American-French computer-animated adventure fantasy comedy family film directed by Sam Fell and Robert Stevenhagen and produced by Gary Ross and Allison Thomas. Loosely based on the 2003 fantasy book of the same name by Kate DiCamillo, the movie is narrated by Sigourney Weaver and stars Matthew Broderick, Emma Watson, Robbie Coltrane, Frances Conroy, Tony Hale, Ciarán Hinds, Dustin Hoffman, Richard Jenkins, Kevin Kline, Frank Langella, Christopher Lloyd, William H. Macy with Stanley Tucci and Tracey Ullman. It was released on December 19, 2008 by Universal Pictures. It was also produced by Universal Animation Studios, Framestore Feature Animation and Relativity Media. Sailor Pietro and his rat companion Roscuro dock in the kingdom of Dor, famous around the world for its delicious soups, during the "Royal Soup Day." The chief cook,Andre makes good soup due to Boldo a magical genie that emerges from his pot and is made entirely out of food.Enchanted by the smell of the delicious soup, Roscuro slips away and ends up in the royal banquet hall, on a chandelier above the royal family's table. He slips and falls into the Queen's soup, giving her such a fright that she has a heart attack and dies. The entire hall goes into a panic, as the guards pursue Roscuro. He attempts to flee the castle, but sees Pietro's ship has already sailed away, and narrowly escapes capture by falling down a sewer drain. It leads to the castle dungeons, where he's found and taken in by Botticelli, the leader of the dungeon's large rat population. Distraught over his wife's death, the king forbids any and all things soup related and makes rats illegal. Without its soup, Dor becomes impoverished and dreary. Andre is banned from making anymore soup and Boldo stops appearing.The king's daughter, Princess Pea, despairs over the sad state of the kingdom and how her father has shut the entire world out, even her, in his grief. In a mouse village in the castle's abandoned kitchen storage room, a baby is born to the Tilling family. They name him Despereaux. 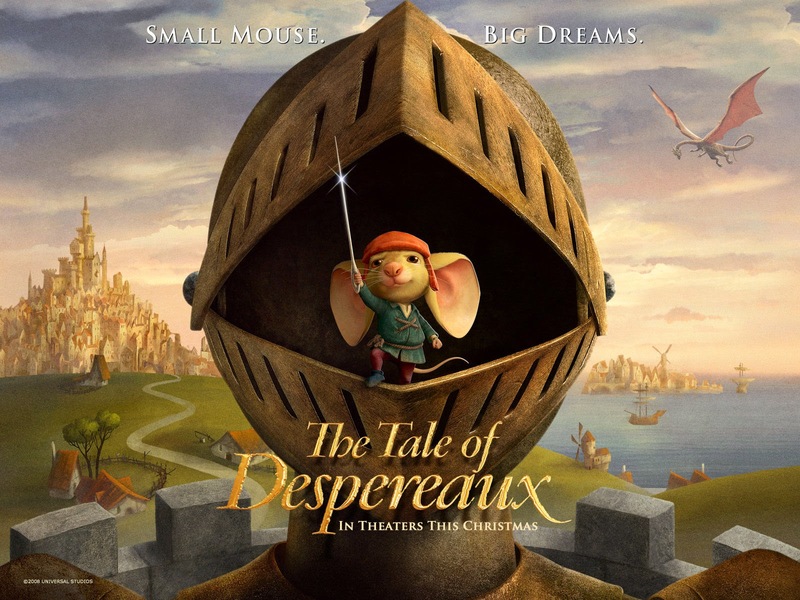 As he grows up, it becomes obvious Despereaux's not like other mice: he isn't meek and timid, but brave and curious, unnerving his family, friends, and school teachers. In an effort to teach him to behave like a proper mouse, his brother takes him to the castle library to show him how to chew books, but Despereaux is more interested in reading than eating them. He becomes fascinated by fairytale books about daring knights and trapped princesses. One day while reading, he comes across Princess Pea and the two speak. She makes him promise to finish reading the story about the princess so he may tell her how it ends. Upon discovering Despereaux has violated mouse law by talking to a human, his parents turn him in to the mouse council. The council banishes Despereaux to the dungeons. There he is captured by the rats and thrown into their arena with a cat. As he's about to be eaten, Roscuro saves his life by requesting Botticelli give Despereaux to him to eat. Having been unable to adjust to being a sewer rat, Roscuro is desperate to hear about the outside world. The two become friends, as every day Despereaux tells him the stories and of the princess and her sadness. Hoping to make amends for all the trouble he's caused, Roscuro sneaks up to Princess Pea's room and tries to apologize, but she's frightened by him and lashes out. Hurt by this, Roscuro decides he wants Pea to hurt just as much as he does. He enlists the help of Miggery Sow, Princess Pea's slightly deaf young maid who longs to be a princess herself and despises Pea for what she perceives to be ingratitude of her position, by convincing her she can take Pea's place if she kidnaps her. After Mig drags Pea down to the dungeons, Roscuro double-crosses her and locks her in a cell. Meanwhile, Despereaux realizes that the princess is in danger. Back in the rat colony, Roscuro sees the apologetic sincerity in Pea's eyes and regrets his actions, but is unable to stop the rats, to whom he has given her, from clambering over her. Roscuro tries to tell the rats that Pea is not bad, but Botticelli does not let him because he wants Pea dead, even going as far as allowing the rats to eat or trample over Pea. Roscoro figures out that Botticelli is a double-crossing traitor and that Pea is doomed. However, Despereaux lets loose a cat, and the rats run away before the cat goes back into its cage. Roscuro then forces Botticelli into the cage, where he is eaten by the cat. Mig is later reunited with her father, who recognizes the birthmark on her neck. It finally rains and the sun shines after soup is made for the first time in years. The mice all then try to be braver like Despereaux. The king is able to overcome his grief and soup and rats are allowed back in the kingdom. Roscuro returns to a life at sea, where there was always light and a gentle breeze, and Despereaux himself takes off on a journey to see the world.